Last night I went to a Brighton Fringe event, Pilgrimage: A New British Tradition of Walking with Soul. It featured Guy Hayward and Will Parsons of the British Pilgrimage Trust who told us about modern pilgrimage, served us foraged tea and led a short journey to St Ann’s Well. The event’s write-up described pilgrimage as “the best form of physical prayer for people who aren’t sure if they believe in prayer”. While the sessions was organised by the Brighton & Hove Centre for Spirituality, a group “rooted in the riches of Ancient Christian wisdom” the religious aspects were never intrusive. Pilgrimage is a walk of one or more days to a site of some type of power. It doesn’t need to be an officially sanctioned holy place, but could be, say, a family grave. Guy and Will have performed a number of pilgrimages leading to their founding of the British Pilgrimage Trust (whose patron is Rupert Sheldrake, who will speak in Brighton this Wednesday – it was at his house where Guy and Will first met). As well as doing the Cheeky Walks recently, I’ve become interested in various aspects of walking, and pilgrimages are a fascinating link. For Guy and Will, walking is connected with song and they shared a number of these with us on the night. The songs often relate to the places they pass – for example, at a war memorial, they would stop to sing Kipling’s lament for his son Jack. I particularly loved the song ‘What is a Man’ (also known as the Fall of the Leaf). Their first pilgrimage was to the Hartlake Disaster memorial, which is remembered in the Hartlake Bridge Song. On reaching the site, Guy and Will arrived at exactly the same time as some descendent of the survivors, who had made their own journey to the site. Apparently pilgrimages generate a lot of coincidences – something that Discordians are great enthusiasts for. There was a psychogeography bingo point for use of the word ‘liminality’. This was part of a fascinating description about how pilgrimage disconnects walkers from everyday life, with the world continuing around them. This reminded me of Guy Debord saying that the derive involved a suspension of the walker’s normal relations to the world and society. Pilgrimage also has a connection with the etymology of holiday as holy-day. Apparently religious journeys were one of the few reasons that a serf could use to escape their feudal obligations. This may have been one of the things that led to the suppression of pilgrimages in reformation times. British tradition turned the pilgrimage internal, encouraging worshippers to stay home and read the gospels. The traditions of pilgrimage go back a long way. I’m often frustrated by the how English tradition is often ignored entirely in favour of yoga, Buddhism etc. Pilgrimage was described as an “indigenous British yoga” with links to questing and the grail. Along with the main aim of a quest, there are often sub-quests that emerged, just like in a video game. Sometimes modern pilgrims will stay in chruches, other times they will wild camp. The mention of how easy this was, just a tarp and a bivvy bag, reminded me of Alastair Humphrey’s microadventures. It was also pointed out that one advantage of a tarp was that you could see clearly what was around you. This led to a discussion of how lying down was the best way to look at stars – and, apparently, it’s a great way to experience a church. So we all went into the sanctuary and lay down. It was an novel and relaxing experience. We were then offered a choice of teas made from rosemary and plantain, (also known as Lord of the ways because it grows well on compacted soil like footpaths). Plantain is particularly interesting as it was the only plant that was taken from Europe to the Americas. It has medicinal properties and can be applied to blisters, where the rubbing will cause it to release its juices. The status of a pilgrim is an interesting one and a pilgrimage is definitely different to a walk – for example, there are the pledges: to go slow, to improve the way (or to right wrongs), to need less, accept more and pass the blessing on. Guy and Will described an almost-primal response of welcome that they received from strangers. There is a social benefit to people just passing through an area. Most people accepted them as pilgrims without suspicion – although a pilgrim’s staff helps make a good impression. The talk included so many fascinating aspects: about drinking wild water and different tastes; pilgrimages among animals, including the mysterious migrations of the Kingfish. We also heard a fascinating story about the clearance of St Helen’s Well in Hastings. This is a modern miracle, “magic in a way” as one of the speakers put it. 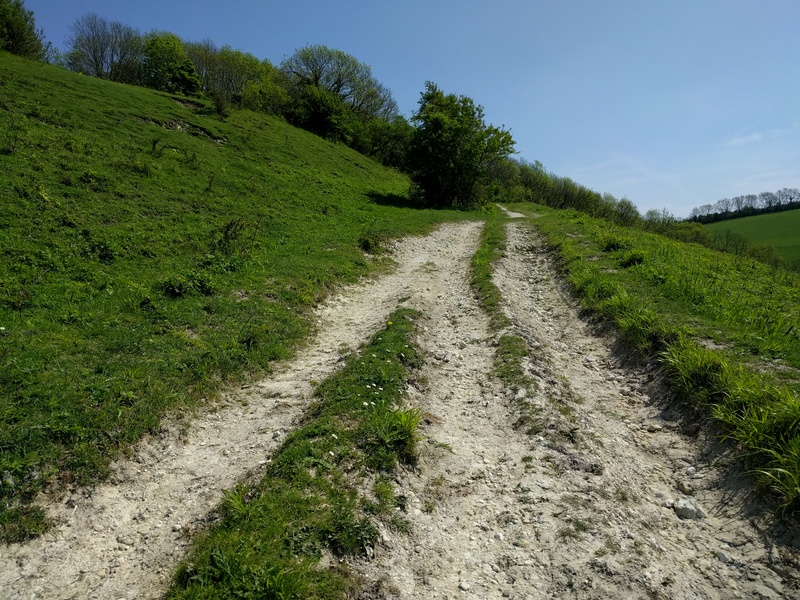 The Pilgrim’s Trust aims to establish a South Downs Pilgrims Way (the North Downs one, as walked by Hilaire Belloc is apparently blighted by a motorway along much of its route). A quarter of a million people a year walk the way of St James in Spain; 200 a year is a good year in Canterbury Cathedral. The Pilgrim’s Trust aims to nuture a revival. The evening ended with a short pilgrimage to St Ann’s Well garden. We circumabulated the well, singing a song to the water. As the speakers said, this is a place that “Probably didn’t get honoured much”, but it was a lovely occasion. Then Guy and Will were off to spend the night at a long barrow before a meeting today. The trust has some bold ambitions and I hope they succeed. It was an interesting counterpoint to the Odditorium’s Edge of Culture night, which is part of another nascent movement. I hope they both blossom.